Kofi Annan's family gather for his state funeral in Accra. The Kofi Annan Foundation confirmed that memorial services will follow in New York City and Geneva after the state burial today. The Annan family wishes to thank most sincerely the many who have expressed their condolences following the passing of @KofiAnnan. The family has found great solace in the outpouring of love and support. Kenya opposition politician Raila Odinga is attending the funeral of Kofi Annan, with several world leaders, and tweeted that he "joined other leaders in paying respect and viewing of the body of former UN Secretary General Dr @KofiAnnan who shall be buried tomorrow. May his soul forever rest in eternal peace." 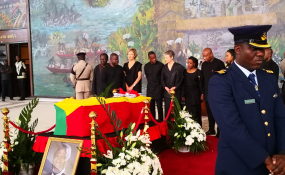 Annan was granted a full state funeral by the Ghanaian government, and the "celebration of life" is being live-streamed here.